I already told you that I recently got the Orly Foil FX range. I love Luxe, but today's post is about Shine. 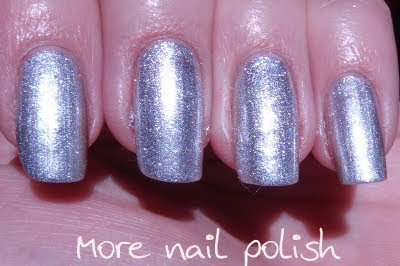 What I have today is a comparison swatch of my silver foil polishes. Can you guess which polish is which before you scroll down? And now some close ups to really try and pick the differences. This is Revlon Diamonds are Forever on the left and Orly Shine on the right. Shine looks a teeny bit darker here, but it's just the angle that my nail is photographed on. Oh, and sorry for the messy application, I really should have done a clean up if I planned on doing such close ups. This is Orly Shine on the left, then SH Celeb City on the right. Again, IRL Shine doesn't look darker like it does here. Finally, SH Celeb City on the left and Ulta3 Snazzle on the right. This is where you can see a difference. Snazzle doesn't have quite the same visible foily particles like the other three. Its finish is much smoother looking. To me, the first three polishes are dupes, and Snazzle is almost a dupe, but just not the same particle size. Do you need them all, well...nope! Whichever one is easiest for you to get your hands on will do just fine to put a tick against 'silver foil polish' on your list. Silver is my favourite nail colour besides teal. 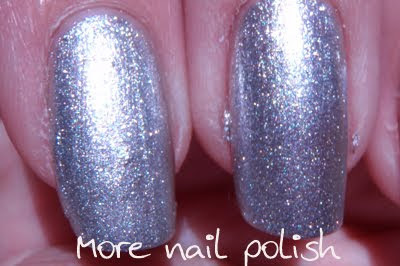 ORLY Dazzle is pretty similar to ORLY Shine. . .or is it just me who thinks that? I love siler polish too, I think it flatters most skin tones too. 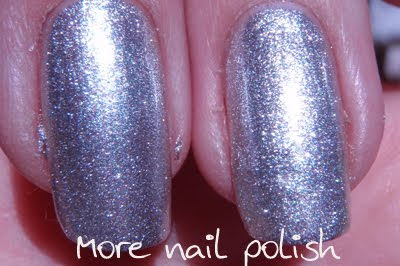 I don't own Orly Dazzle, but just looking online at other people swatches, they do look pretty similar. because I haven't heard of it until I read your blog.